Sometimes simple is better, and that couldn't be more true with a game I just discovered called Chopper by Ajani InfoTech. 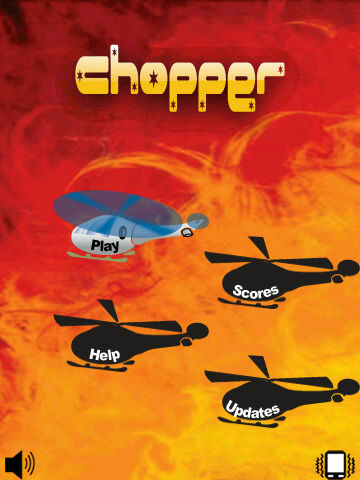 Chopper is an addictive game where you are a helicopter pilot, and you have to navigate through a tunnel avoiding obstacles. Slam into a wall, and the game is over; it's as easy as that. Controls are quick to learn as you only need to press the space bar or touchscreen to go up, and release to fly down. You also have options for vibrate on/off, and volume control, though there really isn't a lot of sound in the game. Because of the simplicity, this one is perfect for entertaining a child while waiting in line, or entertaining you when the boss is droning on in those long meetings. Grab it today while it's on sale for just $.99. There is also a free trial available on this one, so give it a try and let us know how far your chopper makes it through the tunnel in the comments below.